So who really wrote The Bible? Did God come down from Heaven to place His words on paper? Absolutely not! But God’s inspiration is in EVERY word written. This verse doesn’t say “some scripture” it says “all scripture“! God inspired the approximately 40 authors of The Bible to write His words so that future generations could experience what God wants us to know. The verse also tells us why The Bible was written, it is profitable for doctrine – To teach the will of God, and to point out Jesus Christ till he should come. For reproof – To convince men of the truth; and to confound those who should deny it, particularly the Jews. For correction – For restoring things to their proper uses and places, correcting false notions and mistaken views. 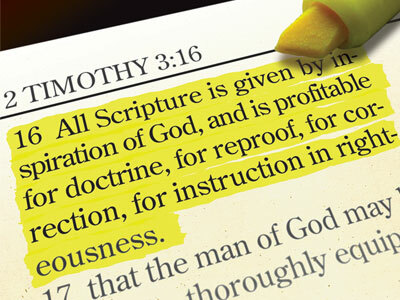 Instruction in righteousness – For communicating all initiatory religious knowledge; for schooling mankind. All this is perfectly true of the Jewish Scriptures; and let faith in Christ Jesus be added, see 2 Timothy 3:15, and then all that is spoken in the following verse will be literally accomplished. Appreciate this Paul, thank you. Of course for those who don’t accept there is a God the question of Authorship is lost (Psa 53:1). And even for some who accept Divine Inspiration they stumble over 2 Tim 2:15 by studying to show others their errors rather than first apply the Bible to themselves which was one of my faults called hypocrisy. But it is comforting to know that inspiration leading to (correct) understanding comes from the Almighty (Job 32:8). Have a blessed day. All we can do is TRY to educate and inform. If people refuse to accept truth, it’s out of our hands. God bless.